The New Pornographers and The Pains of Being Pure at Heart provided plenty of pop-rock punch at Cleveland's House of Blues. It was a cold night in Cleveland when The New Pornographers and The Pains of Being Pure at Heart descended upon the House of Blues Saturday, Nov. 15, a pair of pop-rock bands ready to entertain a long line of shivering fans who had assembled outside the venue before the doors opened. A sizable crowd was on hand for openers The Pains of Being Pure at Heart, who were ready to heat up the crowd with their shoegaze-influenced pop tunes. "Obviously [The New Pornographers] didn't bring us along for our great stage banter" quipped The Pains of Being Pure at Heart's Kip Berman after a quick introduction between songs, leading to quite a few chuckles in the crowd. 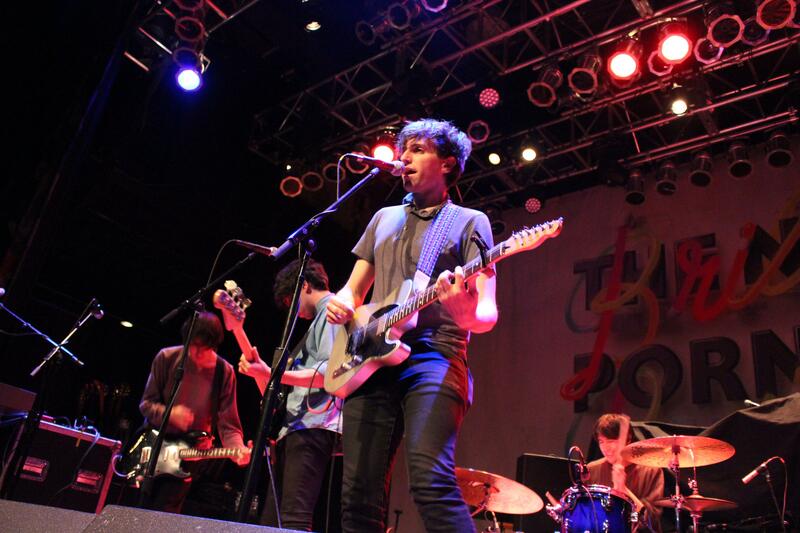 While the members of The Pains of Being Pure at Heart weren't big on conversation mid-show, they certainly put on a show during their opening set, trotting out several new songs from their latest album Days of Abandon as well as a few older cuts. Pains kicked the night off with the gleaming indie-pop track "Until the Sun Explodes," a number that sounds as bright and fun live as it is in music video form. The band managed to maintain the sonic sweetness found in the recorded versions of songs like "Simple and Sure" and "Life After Life" while still giving them a grittier charge in a live setting. By the end of the 45-minute set, Berman and his band provided a rather enjoyable intro for a good night of pop. The crowd didn't have to wait too long for the main event as veteran rock band The New Pornographers soon crowded the stage after a short intermission. Flanked by a pair of neon-lit keyboards, the power trio of A.C. Newman, Neko Case, and Dan Bejar traded off songs from the band's 15-year career, including a healthy dose from neweset album Brill Bruisers. The New Pornographers provided plenty of punch on new songs like the energized "War on the East Coast" and a, well, bruising take Brill Bruiser's title track. One fan may not have received his wish when he requested that The New Pornographers play "all the songs," but the band certainly didn't skimp on its setlist, playing a two-hour show that included two encores that had plenty of older treats. The Candian supergroup played Electric Version's lovely "Testament to Youth in Verse" to full effect, with the veteran rockers hynoptizing the crowd during the songs rousing close. At other points of the set, crowd favorites "The Bleeding Heart Show" and "Sweet Talk, Sweet Talk" kickstarted gleeful singalongs, the audience absolutely loving the heavy doses of sugary pop that the band was dishing out. After 15 years as a band, The New Pornographers have had plenty of time to perfect their brand of pop-rock, and the crowd at House of Blues enjoyed the results Saturday night.